The Chinese military has been doing some sabre-rattling lately. While PLA naval forces have been busy asserting China’s claims in the East China Sea and the South China Sea, there’ve been larger efforts in train to impress upon global players China’s capacity and willingness to engage, if necessary, in broader military confrontation. This has been seen on several fronts. The most obvious manifestation is the very public parading of Chinese military hardware. The CPC’s key ideological journal Qiushi recently showcased  China’s nuclear submarine force for the first time in four decades, even introducing us to some of the commanders, while Xinhua has been widely circulating illustrations of the vessels . 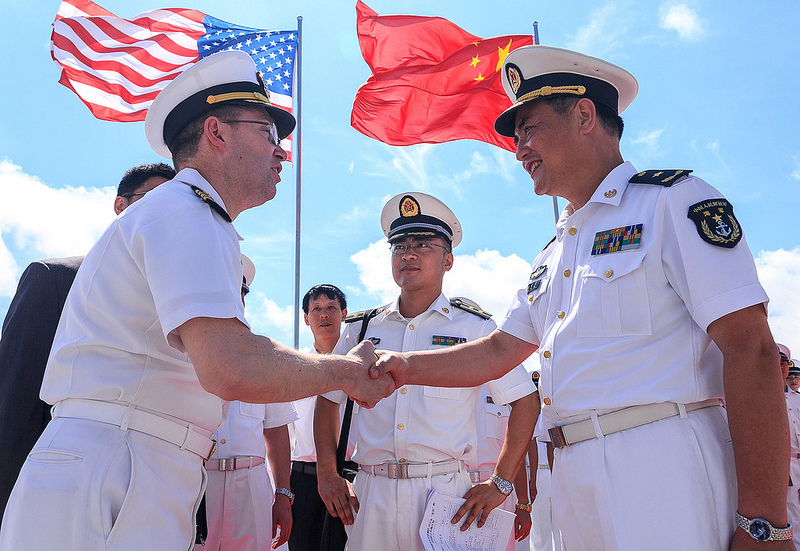 Chinese military capabilities have also been on display closer to the United States, with a PLA Navy electronic reconnaissance ship sailing into Hawaiian waters, reportedly in response to the activities of the USS George Washington  in the Yellow Sea. Photos of new-generation KJ-500 AWACS aircraft  have also been making the rounds. A new fighter plane, the Shenyang J-15 (‘Flying Shark’), has been extensively publicised  within China and abroad, while China’s future weapons have also been given quite some press. We learn that the development of the country’s first stealth fighter—the Chengdu J-20—is well under way and that a military delegation was sent to Moscow in October  to discuss cooperation in the development of an engine for this aircraft. China and Russia have also agreed  that China will purchase at least 24 Sukhoi Su-35 strike fighters. Meanwhile, Senior Colonel Wu Guohui (吳國輝) of the PLA Air Force has revealed in an interview  with Renmin Ribao that China is now developing its own long-distance strategic stealth bomber ( H-18). Wu has further stressed the importance of both offensive and defensive drones in Chinese military strategies, a point underlined  by the wide range of unmanned aerial vehicles on show at the recent 15th Beijing Aviation Expo. Of most concern to the United States is the ‘carrier killer’ DF-21D missile—China’s first anti-ship ballistic missile and a key element in the PLA’s Anti-Access/Area Denial (A2/AD) strategies . Land trials of the weapon have apparently already been conducted in the Gobi desert . The PLA Navy submarine force is responsible for safeguarding national security as well as maintaining peace. China is revealing its nuclear submarine force unit for domestic audiences and the international community so that they can gain a better knowledge of this force. It is not related to the current regional situation. Other observers might suggest that it’s precisely the ‘current regional situation’ which is prompting this flaunting of hardware and capabilities, and that this is a calculated effort, if not to shock and awe, at least to warn and deter foreign polities from engaging China militarily when it deals with issues it considers regional. But there’s another element which is driving these actions, revealed during the launch of a book published, not serendipitously, during the recently-concluded Third Plenary Session of the 18th CPC Central Committee. Entitled ‘China Is Not Afraid—New Threats to National Security and Our Strategic Responses,’ 《中国不怕——国防安全新威胁与我们的战略应对》 the book  is ascribed to 80 year-old General Zhang Min (张民), a Korean War veteran and former deputy director of the Strategy Department at the PLA Military Academy. Suggesting that the United States will never relent in its efforts to contain China, the book is basically a rousing call to the military forces to gird their loins for the potential conflict. The importance of the book in reflecting broader PLA sentiments was demonstrated  by the fact that five PLA generals spoke at its launch. Our Party and our army were founded on the premise of having no fear. The Chinese army should ‘be able to fight, and fight to win.’ It must have the will of fearlessness in the face of strong enemies. In conjunction, these various phenomena begin to assume a coherence that they lack in isolation. Through publicising and promoting the growing power of Chinese weaponry and the military’s near-term regional strategies, the PLA is addressing both foreign and domestic audiences. To those beyond China the message is ‘Stay out and engage us at your peril’, while for those at home the emboldening signal is ‘Fear not’! Geoff Wade is a visiting fellow at the College of Asia and the Pacific, Australian National University. Image courtesy of Flickr user U.S. Pacific Command .